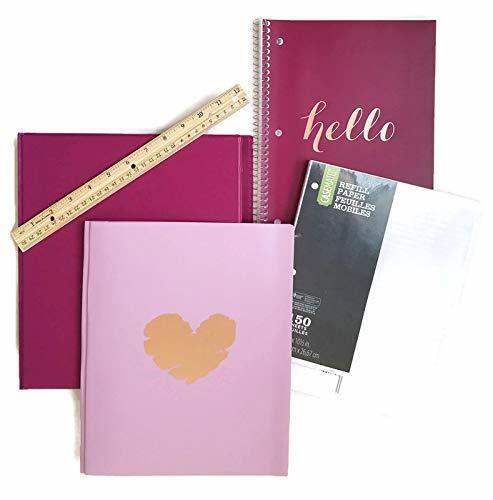 This stylish teen girl's bundle will keep you organized with the 1 inch binder, composition notebook, folder, binder paper and a wooden ruler. The burgundy composition notebook, with a classy gold "hello", has 80 college ruled pages. The light pink, with gold heart, poly 2-pocket folder, with prong, to keep all your projects and homework together. Also included in this school supplies bundle is a pack of binder filler paper and a sturdy wooden ruler. This is the perfect school bundle to keep you organized, whether you're in middle school, high school or college. Teen girl school supply burgundy "hello" 80 page notebook, college ruled. Girl's school supplies light pink, poly 2-pocket folder with 3 prongs will keep your homework organized. Back to school supply binder filler paper, 150 count. Back to school supplies for girls bundle also includes a sturdy wooden ruler.